It's your budget. And maybe you feel like you’ve just got to have something on paper. YNAB does not have a built-in print function, but here are two solutions that will help you share your budget – whether that ends up being paper or not. 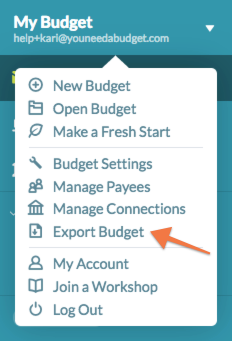 Click the name of your budget in the top-left corner of the app. Your budget and transaction history will export as separate CSV (comma separated value) files, which can be opened with most common spreadsheet apps. Graphs are pretty. Especially if you've paid off a lot of debt. You don't need a printer to save that beautiful trend-line—just take a screenshot. If you're using a Mac, hold Command + Shift and hit 3 (for full screen) or 4 (for partial screen). The file will be saved to your Desktop. If you're using Windows, hold down the Windows Key and hit PrtScn. The file will be saved to the Pictures > Screenshots folder. Just like your exported budget, you can email it to your honey for a budget meeting or post it on Facebook for all your friends to admire. And, yes, you can always print the screenshot if needed!